Laser engraving machine DIY Logo laser engraver printer 3000mW/7000mW wood carving machine. 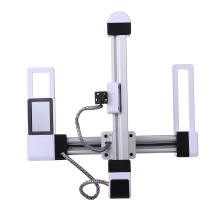 This Engraver can be carved: wood, paper, plastic, leather, bamboo, bone teeth, painted metal surface, etc. Transparent and reflective things can not be carved directly. Aluminum alloy and ABS material, more stable, metal appearance has a strong sense of technology. Add microcomputer panel LCD display, insert a U disk then you can offline using, more convenient. Upgrade laser head, it can engrave more material, fast speed and longer life. Multi-function interface, equipped with power, USB, PC data interface to meet your different engrave need. Drive wheel tape, adopt high quality drive wheel tape to make track, good toughness and wear resistance. Beautiful trace, wire binding, safer to use, more beautiful appearance. Fast exchangeable laser head design+up&down laser focus adjustable. Power adjustable by software. Use on wide variety of materials: Wood, plastic, paper, bamboo, bone teeth, painted metal surface, etc. Installation or assembly is simple, user manual for installation and operation provided.